WARNING: This is going to be long and wordy, so if you don’t really care for beauty box subscriptions, you can skip this post. So, as you may know, I’m subscribed to IPSY and have been getting boxes from them for about nine months. I usually like most of the items in my boxes and it’s just plain fun to get stuff in the mail. Am I right? When I set up my IPSY account, I went through this whole thing where I answered all types of questions to build my profile. What products I like, what brands I don’t like, what brands I’d like to try, skin tone, hair color, knowledge of make up (newbie or expert), my favorite types of products, etc. It was pretty extensive but not at all boring. Another thing I really like is that I can log into my account, go to my “Glam Room”, and rate the things I got. I can say, “I love this! Keep sending me more!” or “I don’t really have a use/need for this.”. I think that’s GREAT for being able to really build and customize your bags so that you always like what you’re getting. I don’t know why, but I decided to try another beauty box subscription to see how I liked it. 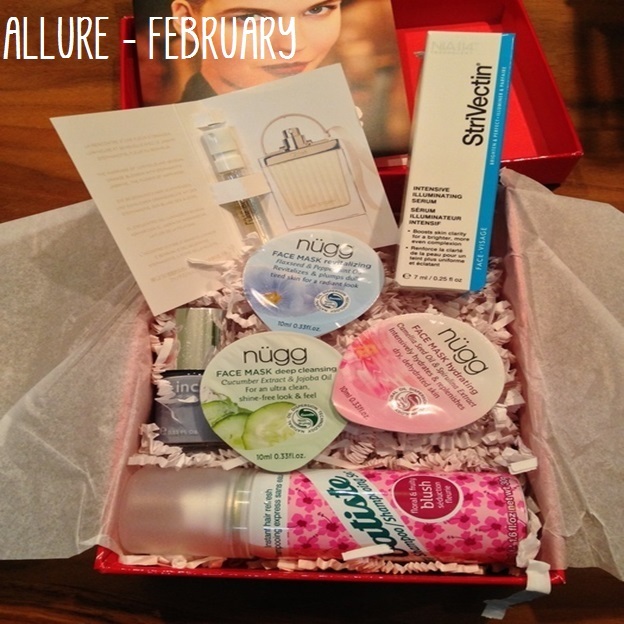 I chose to try the Allure (Sample Society) box. It’s $15/month (IPSY is $10/month). I know Allure is a pretty popular one and it’s a decent price. (I know some beauty boxes can be $25+ plus and that is NOT OKAY with me – ha!) My beauty boxes are really “just for fun”, so $15 is probably my cap. I had a code to get my first Allure box for $5 off. (You can find the code on the site.) I signed up, submitted my payment and address info, answered a three question survey, and was done. There was no profile building or anything like that. Once I realized that, I was a bit nervous about what would come in my box. I mean, there was no personalization whatsoever. Oh, and another thing – with IPSY, you create your profile and answer all the questions BEFORE you enter your payment info. I like that because you can see how personalized everything will be before you commit. With Allure, you pay before you do anything else. I obviously got my money’s worth because that StriVectin product alone is $89. I do think that Allure is more likely to have more well-known brands (like StriVectin), but honestly, aside from the initial shock of “WOW! I got an item worth $89! !” I’m a little disappointed with this box. Yes, the StriVectin is valuable – but I don’t have a need/want for that particular product (Intensive Illuminating Serum – for brightening and evening skin tone, I believe) and I never would have purchased it to try. The facial masks retailed for $1.99 at Target (I happened to see them there the day before I got my box). I do like nail polish, but I don’t see myself wearing that shade (I tend to like darker colors for my nails) and I don’t use dry shampoo or perfume. I knew that this box wasn’t going to be customized to me (due to the lack of questions when signing up), but… EH. I am going to give the subscription another shot and see what I get in the March box. If I don’t like the March box, I’ll cancel this for sure. I was able to log into my Allure account and give the products 1-5 stars, but there was no way to give an explanation. I’ll use the nail polish for example – with IPSY, you can say that you like the brand and formula, but don’t care for shade. With Allure, I gave the polish one star, but since I can’t explain why, does that mean I won’t get any more polishes, at all? Ever? IPSY is just more thorough – and less expensive. So, that’s my ramble on the two subscription boxes. Feel free to ask me any questions!